El turpail provides a classic Los Roques sailing experience to its guests. As it was recently overhauled, it is one of the best sailboats in Los Roques. El Turpail offers a six nights stay abroad the vessel. The package (all-inclusive) includes the two-way ticket from Caracas to Los Roques and back. You are also provided with pick and drop service to and from the airport. El Turpail is designed in Columbie style and its model is Columbie 47ÔÇÖ. The material used in the making of this beautiful vessel is fiberglass and it is a sloop type sailboat. Its year of making is listed as 1971. El Turpail is permanently moored on the magnificently beautiful island of Gran Roque, which is the largest island of the archipelago of Los Roques. Apart from the two crew members, El Turpail has a maximum capacity of six guests. The length of El Turpail is 15.24m/600ÔÇØ. Its width is 4m/157.48ÔÇØ and the draft of this sailboat is 0.2m/7.874ÔÇØ. The beam of this vessel is equal to 3.89m/153.54ÔÇØ. It has a good fuel capacity of three hundred liters and its water capacity is also equal to six hundred liters. The sail area of this beautiful sailboat is exactly equal to one hundred M2. It has an engine of eighty two horsepower (diesel). According to the listed dimensions, the displacement of El Turpail is 20 tons. The electricity specification of El Turpail is 12volts/110volts. El Turpail is a spacious sailboat. 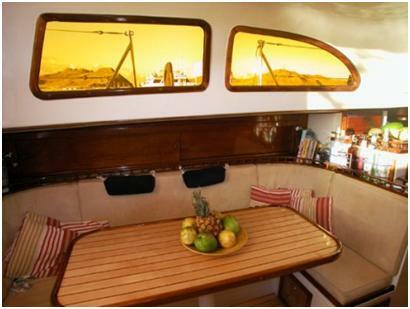 It has a comfortably furnished double cabin which also offers its passengers a private bathroom. Apart from the double cabin, there are also two more lateral cabins. These cabins are also designed with their own private bathroom. El Turpail is carefully designed and equipped with all the latest navigation aids to ensure a safe and sound sailing experience. It has a VHF radio and a satellite GPS. It is also equipped with a Radio Marino. In addition to all these navigation equipment, El Turpail also has a SSB sounder and a telephone.